The vessel is very clean and appears well maintained. All systems are reported by the current owner to be in working order. There is some discoloration on the bimini, but the vessel otherwise appears to be in good shape. 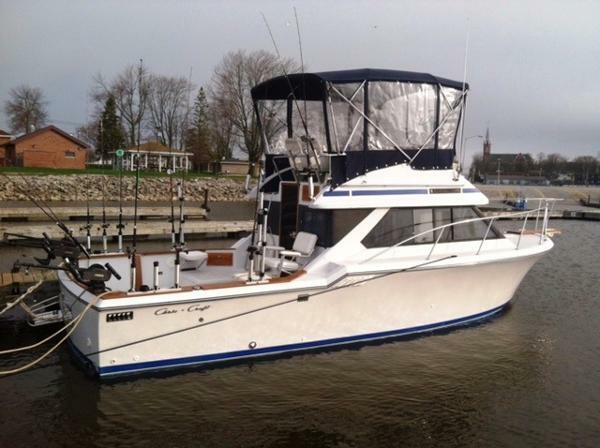 Stock #132676 Very nice Chris Craft Sportfish Commander! Well maintained and ready to hit the water! 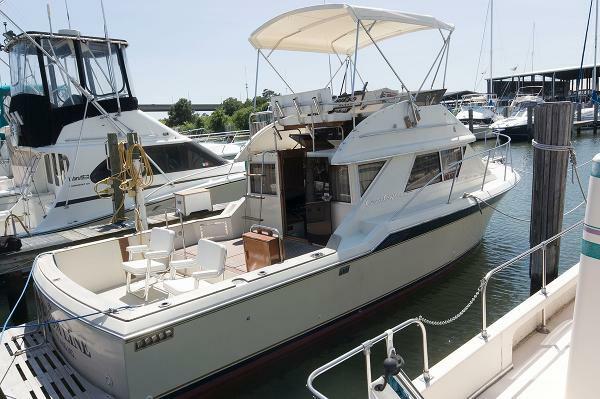 If you are in the market for a sportfish/convertible boat, look no further than this 1984 Chris-Craft 315 Commander Sport Fish, just reduced to $12,500 (offers encouraged). This vessel is located in South Glastonbury, Connecticut and is in great condition. She is also equipped with twin Mercruiser engines that have 1,000 hours. Reason for selling is looking for a bigger vessel. 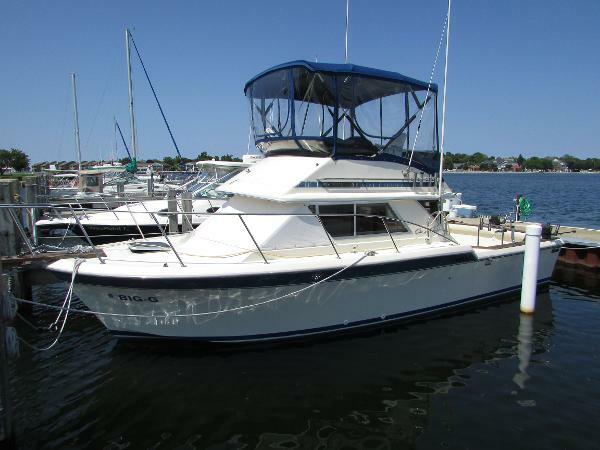 Per the Seller: Powered by twin Crusader 350 cid/270 hp gas engines with 1751 hours. This boat starts right up and is ready to fish. The current owner does most of his own routine maintenance on the boat, and the bilge pumps were recently replaced. Bimini top is in good shape, but the side curtains are off the boat due to storm damage Stock #099276 1988 Chris Craft in fantastic shape - beautiful and ready to hit the water! 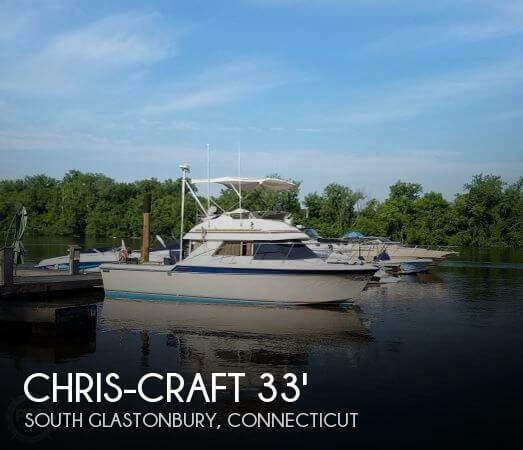 If you are in the market for a sportfish/convertible boat, look no further than this 1988 Chris-Craft 315 Commander, just reduced to $12,500 (offers encouraged). 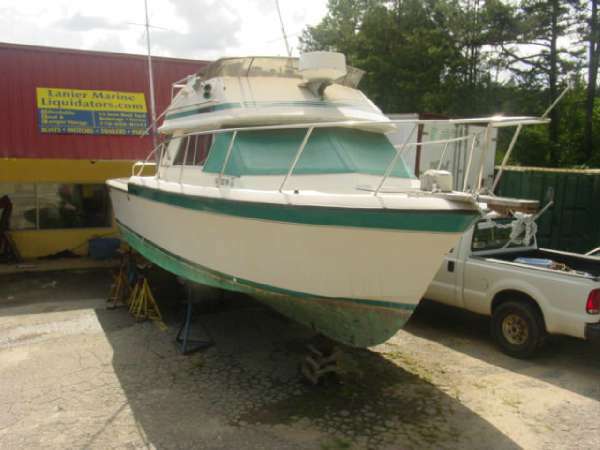 This boat is located in Deale, Maryland and is in good condition. She is also equipped with twin Crusader engines that have 1,751 hours. 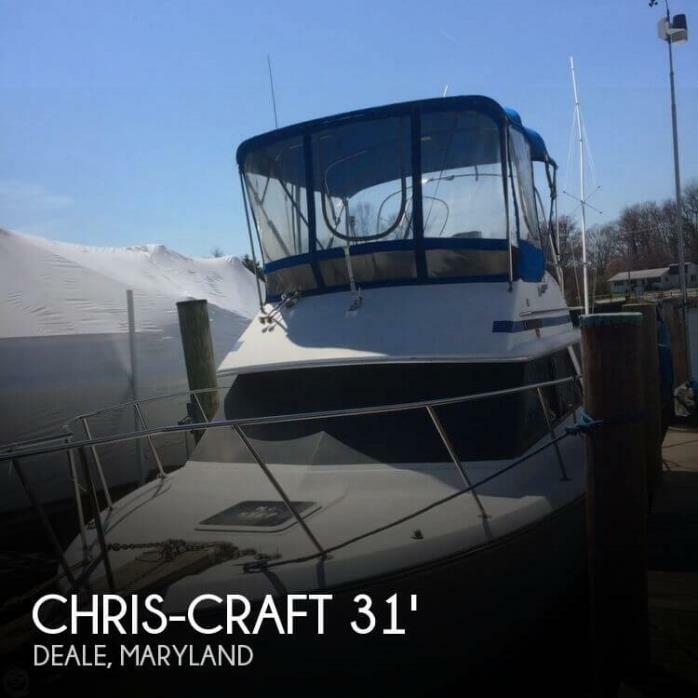 Reason for selling is cannot use anymore do to disability..
1984 Chris Craft 315 Commander Brokers notes: This is a freshwater one owner boat. She has had fantastic care over the years and was repowered in the early 2000's with brand new 454 Crusaders-fuel injected! Whether a fisherman or a cruiser the 315 Commander has a wonderful layout for a boat of this size. She's always been in Lake Michigan and always had the same owner! She has a fantastic shine and her deck is solid and in great shape. She's worth a look if you're in the market for an affordable bridge boat. She got all new canvas on her bridge in 2015. 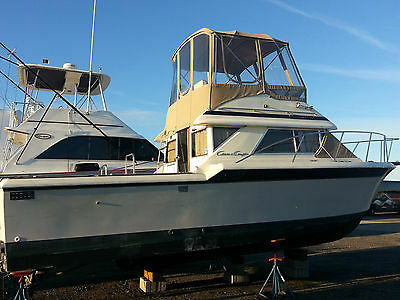 1984 Chris Craft 315 Commander sportfish. A real nice fishing boat for the owner who does not mind giving her a little TLC over the winter. The boat is structurally sound and is in overall great shape for her age. Was well maintained by the previous owner. Has twin inboard Mercruiser 340's. Gas engines, not diesel. Previous owner stated that one engine was rebuilt in 2014 and has less than 10 hours on it (no paperwork). The other engine ran fine (hours unknown). Boat has A/C and an Onan Generator. Eisenglass enclosure on flybride is new. Boat does need some TLC. She has been dry docked for a year. Engines were winterized when she was hauled. The boat ended up taking on heavy rain water that partially filled the engine compartment and saturated the carpet inside. Carpet was removed and needs new carpeting. New bilge pump batteries were installed and pumps are now operational. Rain water may have caused damage to the generator and A/C unit, but this has not been confirmed since the units have not been run since she was hauled. Engines have not been run since she was hauled and winterized as well (marina claims boat ran well and can be moved by water if needed). Boat has a V Berth, a head, nice galley area, and a dinette that converts to an additional bed. Hull, shafts, props and struts look good. *** The boat is being sold as is and is represented as needed some TCL. Any survey is at buyer's expense and not a contingency of the sale. No sea trials, as she is dry docked. Boat can remain stored at current marina. Boat is located in Atlantic City, New Jersey. Great deal on a clean fishing boat! Other 315 Commanders are selling between 15K to 25K+. No Trailer. Boat is 31.5ft long. 11ft 9in beam. 11,400lbs +/-. 250 gal fuel tank, 40 gal water tank. John - (954) 559-5879. Please feel free to contact me with any questions or to see the boat.